Let's talk about one of the most effective ways to reach and engage consumers, SMS Marketing. Consumers love using text message; it's simple, convenient, and readily available. And because consumers love it, you need to love it, use it, and embrace the power of SMS Marketing. To help you better navigate this powerful channel we're covering, 7 Best Practices for SMS (Text Message) Marketing. While text message has been around for over 20 years, only recently has it become a popular B2C communication channel for marketers. It's become so popular among consumers that, it is now the preferred communication channel for consumers to interact with brands and businesses! In fact, 89% of consumers state that they would like to use mobile messaging to communicate with businesses (Global Mobile Messaging Consumer Report, Twilio). 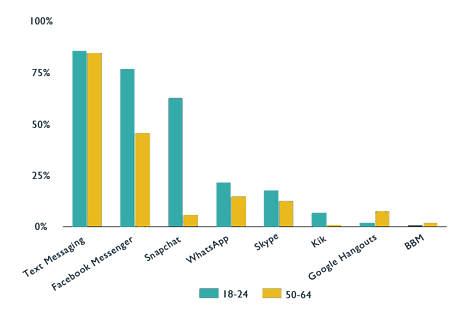 Additionally, when we look at Canada specifically, Canadian's too prefer text message (SMS) over any other messaging channel (Figure 1). It is predicted that by 2020, 48.7 million consumers will subscribe to receive messages from the brands and businesses they trust, that's +76% growth since 2016 (Textlocal). When done right, SMS Marketing is one of the most effective ways for brands to reach and engage with consumers. Text message receives 97% consumer adoption in North America, and an open rate 5x greater than email. SMS Marketing can help leverage your business and other marketing channels. Plus with the advent of CASL, this channel becomes even more powerful by building brand trust through a completely compliant database. And, ultimately an extremely qualified database. That said, businesses that do not take prudent steps to ensure full compliance may find themselves in hot water. Continue reading to learn how to remain compliant, build trust, and how to implement the 7 Best Practices for your most successful SMS Marketing strategy. There are two common methods for receiving consumer consent, Handset Initiated Opt-in and Double Opt-in. 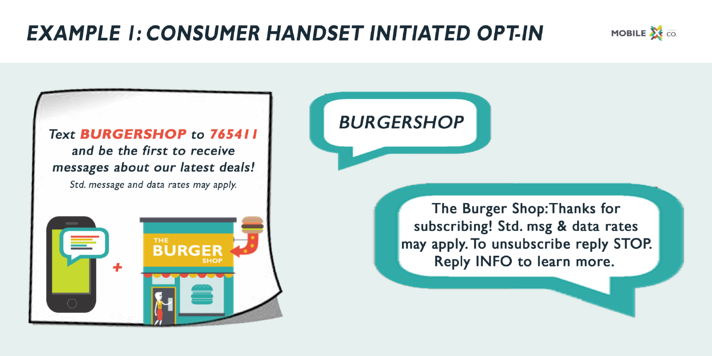 The handset initiated opt-in method allows consumers to simply text in a keyword to a designated shortcode and voila, they have provided consent. Easy right? Take a look at Example 1 below. Double Opt-in, involves one additional step. 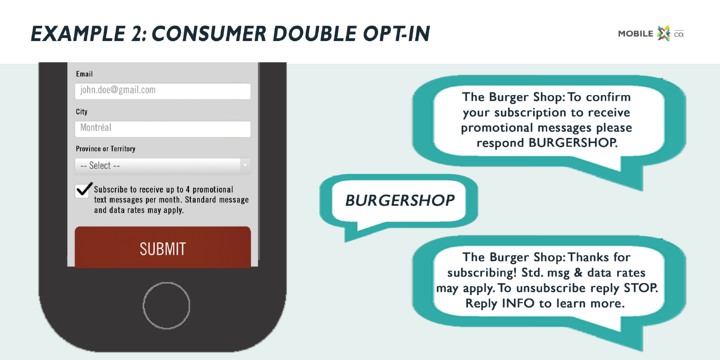 If a consumer fills out an online form and selects a checkbox to opt-in to receive monthly brand messaging, the brand is required to send that consumer a SMS message from their designated shortcode asking the consumer to confirm their subscription (much like double opt-in for email). See Example 2 below, for what it might look like. While there is no hard and fast rule with respect to picking text message keywords, we typically recommend using a brand or business name as the primary keyword for building a subscriber database. Alternative keywords are great for campaigns and setting language preferences. Running a SMS Marketing campaign often requires 2 keywords, one for the text call-to-action and one for subscriber opt-in. For the text call-to-action keyword we recommend using the campaign theme as a means to generate ideas. 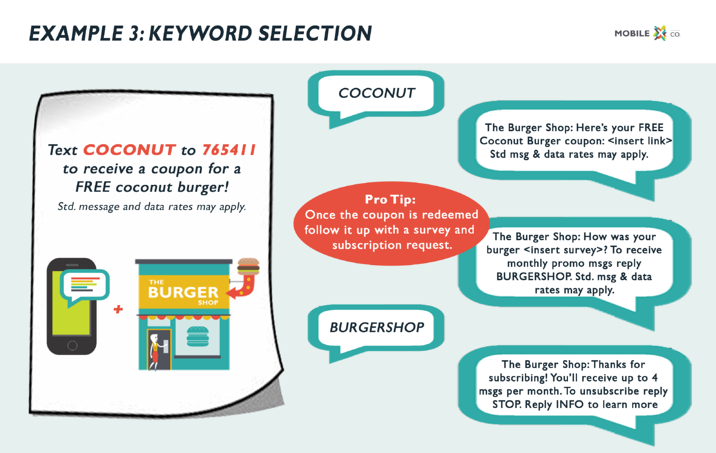 For example, if The Burger Shop is offering a coupon for a free coconut burger they want to select a keyword such as COCONUT. In a situation where a campaign requires both English and French communication the French equivalent, NOIX DE COCO, would be selected as a keyword to easily set a consumer's language preference to French. Keep it professional! The messaging should reflect the brand and represent the business. There is nothing worse than receiving a message that looks like a cryptogram. Don't do this: Go 2 The Burger Shop 2day 4 10% off ne coconut burger! Do this: Visit The Burger Shop today for 10% off any coconut burger! Also, if consumers subscribe to receive promotional texts, then send promotional texts. You should avoid sending other types of messages because it could end up annoying your audience with information they didn't ask for. Almost everyone has been part of that one group chat, you know the one that keeps blowing up your phone with endless messages about Suzan's cat. Ping, Ping, Ping, PING! Every 20 seconds. It's annoying and distracting! Subscribers have trusted the brand with access to their most precious inbox, we don't want to abuse it. We recommend keeping messages around 2-4 per month. Timing is just as important as frequency and content; it's all about respecting the consumers. This is why you should only send messages during business hours. While late night updates from our cousin travelling the world can be exciting. A two am wakeup call about 50% off apps may not have the same effect. Plus, if you want consumers to take action after reading the text, then it makes most sense to send it during the hours consumers are most likely to take action! You may be tempted to skip over this one, after all why would subscribers ever leave you!? As much as we'd love to believe that it will never happen, chances are it will, for any number of reasons. It's critical to make the opt-out process as easy as the opt-in process. Every message sent needs to include an opt-out option, which is, that at any time sending STOP to the designated shortcode allows consumers to opt-out. This freedom adds to their trust and lets consumers know the brand is not some annoying pop-up ad that just won't go away. Compliance may not be the most exciting best practice but it's especially important if you want to avoid that hot water we mentioned earlier. To understand the complete rules behind SMS marketing we recommend visiting the CWTA. In the meantime, we'll cover a couple essential requirements. You are required to include the following disclaimer anywhere you use a text call-to-action (this includes advertisements for mobile experiences). "Standard message and data rates may apply." This means a carrier may charge a customer for receiving the brand's text message, just as they would for any other text message. Luckily 76% of Canadians own a smartphone so this will very rarely be a concern for consumers. There are 5 keywords that must be implemented on all text campaigns, they are: STOP/ARRET, HELP/AIDE, and INFO. This simply means at anytime a consumer can text one of these 5 keywords to a brand's designated shortcode and receive the appropriate information in return (see CWTA for more details). Although it may be tempting to only follow one or two of these best practices, it's really more of an all-for-one kind of deal. Like a puzzle, you need to include all of the pieces to produce a finished product. By applying all 7 best practices you're ensuring your next SMS Marketing campaign will be more engaging, build trust with consumers and keep you on the right side of compliance. If you're ready to take your SMS Marketing campaigns to the next level, click the link below to learn more about mobile experiences and real-time data tracking.